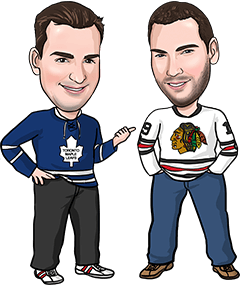 Our Best Bets are now on an 11-2 run after the Leafs beat the Panthers 3-2 last night to go Over 2.5 on their Team Total. We’ve been a bit lucky on those the last couple of nights, though, needing OT or a shootout to cash the last two. The leans yesterday weren’t as fortunate, finishing 1-3. Montreal and Tampa went Over 5, but the Pens/Canes went under by half a goal, the Flyers went over their Team Total by half a goal and the Kings lost 2-1 in Vancouver despite outshooting the Canucks 37-20. There’s a full schedule of 12 games tonight in the NHL. We’ve got our favourite bet of the day below, followed by stats, trends and opinions on the other 11 contests. The Ducks are a proud, hard-nosed, veteran-led team that can’t have forgotten their last trip to Calgary. Less than four weeks ago, the Flames scored 5 second-period goals on their way to building an 8-1 lead before the Ducks got a couple of late ones to make things slightly more respectable, falling 8-3. Calgary blowout victories are hardly the norm in this rivalry. In fact, the Ducks had won 8 straight meetings before the Flames emphatically ended that streak, but we think the situation is right for Anaheim to start another streak tonight. The Ducks aren’t only pissed off about their last game against the Flames, they should also be a motivated bunch after losing their last 3 games. Anaheim stumbled into the Christmas break after playing 6 road games in a 10-day span, but a few days off appeared to rejuvenate them as they thoroughly outplayed San Jose Tuesday despite falling 3-2 in OT. The Flames have been playing well and won’t just roll over here tonight. But even though they’ve won 5 of their last 7 at home, they’re just 8-9 at the Saddledome on the season. Their defence has been a little leakier of late as well, allowing 3+ goals in 4 of their last 6 outings. Anaheim has tightened things up a bit, meanwhile, allowing 2 regulation time goals or less in 3 of its last 4 games. Reasons to bet New Jersey: The Devils pay close to 2:1 on the moneyline. Washington has lost 3 of its last 4. Reasons to bet Washington: The Capitals are 12-5 at home and have won their last 7 games against the Devils. New Jersey is 4-12-5 on the road and has lost 16 of its last 21 overall. Reasons to bet Boston: The Bruins are 10-6-4 on the road and dominated the red-hot Blue Jackets Tuesday despite losing the game, outshooting Columbus 40-22. Buffalo has allowed 3 goals or more in 8 of its last 10 games. Reasons to bet Buffalo: The Sabres snapped a 4-game losing streak with a 4-3 win Tuesday in Detroit. Boston is 3-7 in its last 10 games, allowing 4 goals in 6 of those outings. Reasons to bet Toronto: The Leafs won their third straight road game last night in Florida and are now 6-6-5 away from home. Tampa allowed 3 goals last night for the 7th time in 9 games. Reasons to bet Tampa: The Lightning should have some momentum from last night’s 4-3 comeback win over Montreal, when Tampa scored twice in the third period to tie the game, then won in OT. Toronto has lost 5 straight in Tampa. Reasons to bet Montreal: The Panthers have just 3 wins in their last 12 games. Reasons to bet Florida: The Canadiens have just 2 wins in their last 7 games and 3 wins in their last 11 road games. Reasons to bet Detroit: The Red Wings are a better team on the road, where they’re 8-6-1 on the year. Ottawa blew an early 3-1 lead Tuesday to lose 4-3 to the Rangers, snapping the Sens’ 4-game winning streak. Reasons to bet Ottawa: The Senators are 11-5-3 at home and are clicking offensively, scoring 3+ goals in 5 of their last 6 games overall. Detroit has lost 6 of its last 8. Reasons to bet Chicago: The Blackhawks are 9-6-1 on the road and should be hungry to snap a 3-game losing streak. Nashville has lost its last 4 games at home. Reasons to bet Nashville: The Predators have tightened up their game defensively, holding 4 of their last 5 opponents to 2 goals or less in regulation time. Chicago has lost 4 of 5 trips to Nashville. Reasons to bet Columbus: The Blue Jackets have won 13 straight games. Reasons to bet Winnipeg: The Jets have won 4 of their last 5 games, including a 3-1 win in Chicago Tuesday. Winnipeg has swept the season series from Columbus in each of the past 2 years. Reasons to bet New York: The Islanders have won 3 straight games and should come in full of confidence after beating Washington 4-3 Tuesday. New York has won 7 of its last 10 versus the Wild. Reasons to bet Minnesota: The Wild has won 11 straight games, scoring 3+ goals in all but 2 of those wins. Minnesota is 12-3 at home and New York is 3-7-2 on the road. Reasons to bet Colorado: The Avalanche has been better on the road this year, where it is 8-9. The Avs have allowed 2 goals or less in 4 of their last 6 road games. Reasons to bet Dallas: The Stars have won consecutive games for the first time since Nov. 10-11 and are 3-0-1 in their last 4 games. Colorado has lost 6 of 7 and 13 of 16. Reasons to bet Los Angeles: The Kings outshot Vancouver 37-20 last night despite losing 2-1 to the Canucks. Edmonton is playing its first game since Friday and has lost 6 straight versus LA. Reasons to bet Edmonton: The Oilers are 3-0-1 in their last 4 games and 4-1-1 in their last 6. LA is playing its 9th straight game on the road, where the Kings are 7-10-3 this season. Reasons to bet New York: The Rangers overcame an early 3-1 deficit to beat Ottawa 4-3 Tuesday and improve to 7-3 in their last 10 games. Arizona has lost 5 straight games, scoring a total of just 8 goals. Reasons to bet Arizona: The Coyotes have outshot their last 5 opponents by a combined total of 160-140, so at least the effort is there. New York has allowed 17 goals in its last 3 games.